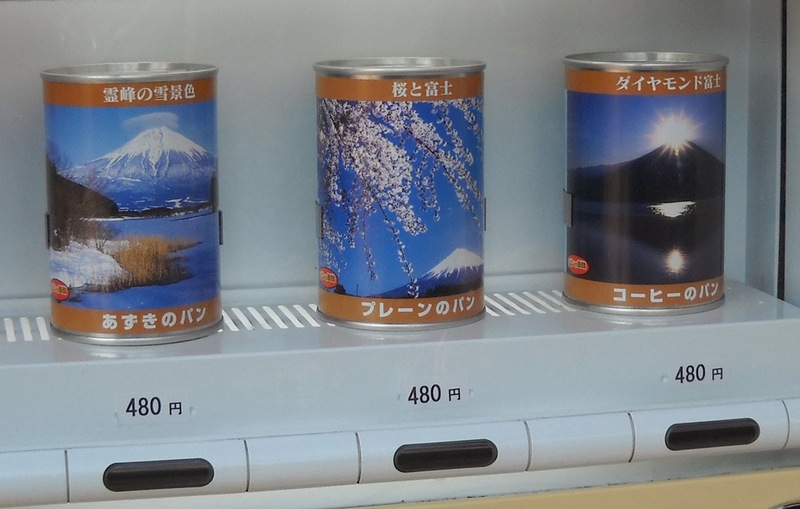 Assuming you cannot read Japanese or haven't taken a moment to scrutize the picture from a vending machine shown above, I'd like you to take a moment to guess at what is being sold in these cans. All of these feature Mt. Fuji at different points in time - in winter, in spring with cherry blossoms, and the last one says, "diamond Fuji" which I imagine is the sun over Fuji in summer? What cannot item do you think fits the motif? The truth is that I'm not sure what sort of canned food fits these scenes, but I wouldn't have guessed that it would be what it turned out to be. These cans are full of bread. From left to right is adzuki (red bean) bread, plain bread, and then coffee bread. I guess that, if you climb Mt. Fuji, you might benefit from a canned carb boost. That would make more sense if this picture was taken on the ascent up that mountain, but this machine was nowhere near it. It was in Tokyo in Kichijoji's Inokashira park. Perhaps the bread was made from something on Mt. Fuji, but I doubt it. My guess is that it's just a tourist thing. Any thoughts? I would have guessed air. I hear there is air you can buy in souvenir shops that reportedly have Mt. Fuji air. I doubt it. That's a fantastic guess! It's nor correct, but I like it better than bread in a can! Seeing Gibberish in My Posts?